Canadian cable TV channel The Comedy Network is introducing a new visual identity. This includes a new wordmark logo, which replaces the cheesy oval the network has used in various forms since the 1990s. The Comedy Network is essentially the Canadian equivalent of Comedy Central and has long benefited from an exclusive license agreement which gives it access to all original productions from the US channel. Just like Comedy Central, it seems The Comedy Network is switching from a three-dimensional on-air environment to more flat graphics, although the typography is less bold and the colors are brighter. On Wednesday, Corus Entertainment and Disney-ABC Television Group announced that they were going to launch a new TV channel in Canada in the spring of 2012. It will be called ABC Spark and is based on Disney's ABC Family, a network with programming aimed at a target group called "millennials", teens and young adults between 15-34 years old. Yesterday, October 27, the city of Minneapolis, Minnesota launched its new tourism logo and tagline at a public event. This is part of a program that seeks to attract more tourism. "The City of Lakes" will now market itself as "City by Nature", touting the many parks in the city. The logo also reflects this, showing four Minneapolis landmarks reflected in water as trees. The state of Minnesota is also in the process launching new brand identity, hoping to communicate that it is more than a cold place with nice people. Televisão Pública de Angola (TPA), the national broadcaster of Angola, launched a new corporate identity this month. Reports say the new logo was launched on October 18 along with some schedule changes. The round red logo replaced a shiny oval that resembled an eye. Yesterday, October 26 , the Austrian public broadcaster ORF launched two new TV channels, a cultural and informational programme succinctly named ORF III Kultur und Information and the sports channel ORF Sport Plus. The two channels are replacing TW1, a tourism and weather channel managed by ORF. ORF Sport Plus was previously a programming block on TW1, but will now get its own channel space. While ORF Sport Plus has a straight-forward elongated logo, while ORF III uses three trapeziums to make up the roman numeral 3. While not optimal for legibility, this solution could open the door to some creative animations in on-air graphics. The logos of all four ORF TV channels can be seen below. ORF has apparently not aimed at consistency, using different typefaces for all logos and three different ways to express numbers. On Tuesday, October 25, The Maldives Marketing and PR Corporation (MMPRC) unveiled a new logo to market the island nation to tourists. It features a swirl of animals that highlights the "unique natural characteristics" of the little country located in the Indian Ocean. It also introduces a new slogan, "Maldives – Always Natural". The new identity was created by the tourism branding agency Quo Keen in Bangkok and London. Cnet has reintroduced the classic "pipe" logo it used when it launched in the 1990s, three years after the popular technology site replaced it with a simpler wordmark on a red sphere. The "pipeless" logo was part of a site redesign that saw them give up its neon yellow background and "web 1.0" aesthetics. It was first previewed in June 2008, around the time the site was purchased by CBS Corporation. The new design finally launched on August 27, 2008. Overall, that redesign centered around simplicity, and the dropping of the pipe was part of this approach. The resurrected logo has been given a "disc-like" effect, somewhat similar to the current ABC logo. It has been used at least since the early part of October. New Leaders for New Schools, is an American charitable organization that supports education by recruiting, training and coaching principals. Last week, on October 18, it introduced a new look has shortended its name to simply "New Leaders", which one assumes most people familiar with the organization called it anyway. The new identity was created by Chermayeff & Geismar, with strategic expertise from The Glover Park Group, and includes a new symbol with an upward-pointing arrow. Interestingly, even though the mark was only launched last week, it is already featured in Chermayeff & Geismar's latest book, Identify: Basic Principles of Identity Design in the Iconic Trademarks of Chermayeff & Geismar, which drops on October 31. Anna's is a brand of gingerbread cookies, that originated in Sweden and is sold under royal warrant from the King of Sweden. 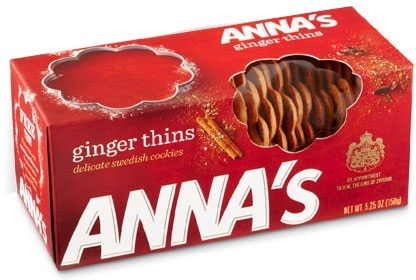 A bakery in Canada produces Anna's brand cookies for the North American market, where the Anna's thins received a new package design a couple of months ago, created by Turner Duckworth. The logo has been refined, and the four flavors have been given new warm color coding, red for Ginger Thins, blue for Almond Thins, orange for Orange Thins and green for Chocolate Mint Thins. ORS (an abbreviation of Österreichische Rundfunksender) is the company responsible for operating television transmitters in Austria. It used to be an integrated part of the state broadcaster ORF, but became an independent company in 2005, although ORF still maintains a majority share. Its costumers include all TV channels broadcasting terrestrially in Austria. In May, ORS introduced a new corporate identity to reflect "continous technological change". The squares from the previous logo have been replaced by cubes, representing the company's three core business areas. Last week, the company launched a new website, with a design inspired by the new logo. So far, the Oprah Winfrey Network (OWN), launched at the beginning on this year, has been something of a disappointment, with ratings below those of Discovery Health, the network that it replaced. However, OWN ramped up its programming when the fall season started on October 10 with the premiere of Oprah's Lifeclass, a new daily program hosted by Oprah herself, and Rosie O'Donnell's The Rosie Show. Ahead of these premieres, OWN introduced an updated logo. It doesn't stray too far from its predecessor, but removes the serifs, adds some rounded corners, and reworks the lines inside the letters. Just like the previous logo, it can take on several different colors; the blue logo seen above is just one of several variations. The previous logo was quietly unveiled with a blog post on the OWN website in Mid-October last year, before hitting screens on January 1. The logo was credited to Bruce Mau Design, while the glossy on-air graphics were created by Bigsmack. Last week it was announced that Discovery Communications are launching a new free-to-air channel in Spain. It will be called Discovery MAX and is launching on January 12, replacing Veo TV, a national channel with Spanish content that has had financial difficulties. Discovery MAX will carry non-fiction content from other Discovery networks. The company also operates channels under the similarly named DMAX brand in Germany and the UK. Spanish media reports about the launch have included the logo seen on top of this article. It remains to be seen what eventually ends up on Spanish screens. Ironically, Veo TV introduced a new logo last month. Grundy UFA and Grundy Light Entertainment (LE), two German TV production companies, unveiled new logos yesterday, October 20. Both companies are owned by RTL Group, Grundy UFA produces scripted drama series, while Grundy LE does light entertainment, such as variety and game shows. They are behind several popular German drama series and programme formats. The rebrand means that the Grundy-G previously used by both companies disappears from the German market. Grundy UFA also drops the "UFA-rhombus", as well as the space between its two names. Instead, we get new all-caps wordmarks, with some quirky cuts in the lettersform to create "a dynamic design". The new logos were created by the Cologne agency Buntebrause. Novacaixagalicia, a savings bank in Galicia, Spain, announced yesterday that they were changing their name to Novagalicia Banco and introducing a new corporate identity. Novacaixagalicia was created last year through the merger of Caixanova and Caixa Galicia as part of the restruction of the Spain's savings banks following the financial crisis. The previous identity was a typical merger identity. The name was a combination of the names of the two previous banks, and their corporate colours (green and blue, respectively) where included in the symbol. The symbol remains with some updates, but is now all blue, a colour associated with the Galicia region. The logo also receives a new typeface. Last week, a new visual identity was unveiled for Moscow's historic Bolshoi Theatre. The new logo was developed by Art Lebedev Studio, and should formally launch at the end of this month, when the theatre opens after major renovations. Founded in 1776, the Boshoi (Большой театр, meaning "The Great Theatre") is an important symbol for Russian high culture and is well-known around the world. The previous logo was introduced a few years ago and is credited to Yuri Grymov. It had been the target of criticism from Russia's design community, among other things because it apparently featured decorations borrowed from a free image library. The Zeum, a multimedia children's museum in San Francisco, reopened las week, on October 15, as the Children's Creativity Museum. The new visual identity was credited to Landor Associates in a press release sent out on October 11. It introduces the "creativity critters", a bunch of cute, bright and friendly mascots that can bee seen around the museum. The Norwegian state broadcaster NRK has three television channels, and they all got new logos last week, on October 11. The previous logos for NRK1 and NRK2 were introduced in the early 00s and consisted of the corporate NRK logo with a custom-made numeral attached to it. When NRK3 launched in 2007 the new channel received a similar logo. This redesign takes the numerals and puts them into colour-coded circles. The circle has been a widely used motif in NRK's on-screen graphics for over a decade, starting out with the circle in the corporate logo. The corporate NRK logo itself was adopted in 1970 when NRK was a monopoly. Its creator was an artist named Ingolf Holme. As part of a company-wide identity programme around the turn of the millenium, the logo received a barely noticable update that rounded out some sharp edges. The old and the new channel logos can be seen below. The energy technology company American Superconductor announced yesterday that it would start referring to itself as AMSC, elevating its stock ticker abbreviation to company name. American Superconductor develops electrical grids and wind energy, and is often mentioned in discussions about the future green economy. Although it started out in the United States, it now has activites in Europe and Asia, which might explain why they are dropping "American" from their name. The name change brings a new logo, incorporating the symbol from the previous logo in a blue square. GFI Informatique, a French IT services company, unveiled a new corporate identity last week, on October 12. The new logo is intended to represent the company's "commitment to proximity and its ability to think differently and to innovate in offering global, value-adding solutions". It does this by using a friendly monogram, where the ligatures represent links between employees and costumers. The orange-gray colour scheme was selected to ensure visibility, while also representing different values. Orange generally stands for more lively values like dynamism and enthusiasm, while the gray suggets sobriety and reflection. Back in July the American regional airline Atlantic Southeast Airlines (ASA) announced that it would adopt the name SureJet as it was merging with ExpressJet, a previous competitor. The plan backfired after protests from employees, and the name was retracted faster than you can say "Gap logo". Last Friday, October 14, it was announced that the name ExpressJet would be adopted for the entire company. The new name and logo had been rooted in the company through an internal vote. The slightly altered ASA symbol that was used for the retracted SureJet logo will be used for the new ExpressJet logo. Travel+Escape is a Canadian cable channel dedicated to "exotic destinations, culinary darings, paranormal experiences and sports and adventure expeditions". It is essentially a Canadian equivalent of the Travel Channel. Launched in 2001 as CTV Travel, it got its current name in 2006, and CTV sold the channel to a small broadcaster called Glassbox last year. On October 5, Glassbox announced that Travel+Escape would be relaunched on November 1 with a new visual identity, created by a company called Mighty. OzTam (Australian Television Audience Measurement), the company that collects television ratings in Australia, unveiled a new corporate identity today, October 17. The new logo was developed in-house, with some assistance from Seven Design, the Seven Network's design team, in the final stages. The French biscuit brand LU, or Lefèvre-Utile, originated in the mid-19th century. Today it is present in several international markets and is a part of Kraft Foods, after the multinational snacks company bought LU during one of its shopping sprees. Recently, LU started using a refreshed logo on the French market. Dragon Rouge are credited for this redesign. LU has long been identified by two elongated white letters on a red rectangle. The first iteration of this logo was designed in the 1950s by Raymond Loewy. A redesign in the 1990s added a curl to the logo that revealed its yellow backside. This latest redesign replaces the rectangle with a more dynamic irregular background plate. As is fashionable today, the letters now have rounded corners, and some slight drop shadows and bevels are included. It also adds the tagline "creator of biscuits since 1846". On Wednesday, September 12, the major Australian real estate firm Raine & Horne launched a completely new corporate identity, created by the branding agency IdeaWorks. At the center of the new look is a friendly wordmark and a gold-grey colour scheme. "Gold is warm and optimistic and ignites passion and represents the leadership Raine & Horne takes in the real estate industry", says Kit Bashford who is a communications manager at the global firm. The "unique hand-crafted bespoke" ampersand is central in the new identity, and can be used as a stand-alone identifier or visual device. United Talent Agency, a major California talent agency, unveiled a new visual identity yesterday. It is credited to Siegel+Gale. Several paint brands belonging to the Dutch chemical company AkzoNobel have been given a new common visual identity, created by Design Bridge. Overall it is about a dozen different brand names that are getting a new look, the most prominent being Dulux, which is used in many Anglo-Saxon, Asian and European markets. Other affected brand names include Flexa in the Netherlands, Levis in Belgium, Sadolin in Denmark, Bruguer in Spain, Marshall in Turkey, Vivechrom in Greece, Alba in Argentine, Coral in Brazil and Inca in Uruguay. Dulux logo used in the UK. Having previously used different brand identities in different markets, the names are now joined under the "Let's Colour" brand platform. The phrase acts both as a strapline and a generic designation for the product category. At the center of the new design is the "Flourish logo", a lively colour wave extending from the hand of a white figure, epitomizing the "Let's Colour" spirit. The new look has been in use for some months; it was launched in India in mid-August. The rebrand has gotten additional attention this week, as AkzoNobel has dubbed October 10-14 "Let's Colour Week" and the new design is launching into Western markets. Other regions are scheduled to follow during the year. A month or two ago, the Philippine EastWestBank launched a new corporate identity, created by FutureBrand Singapore. The bright logo features a purple and limegreen colour scheme and the FF Max typeface. "Our new brandmark is created from two arrows representing the directions of our name, east and west, coming together to symbolize the relation ship between the Bank and customer, in the heart of which good things happen. The two arrows meeting together create a center that represents our focus on customer needs and expectations, consistent with our brand tagline – Your Dream Our Focus. The "arrows", the typeface and the color scheme are also used throughout the bank's annual reports, ads and publications. A news article suggests the new logo was launched on September 2 to celebrate the bank's 17th anniversary. The Philippine design blog One Design PH published an article in Mid-August that provides more details and images. Noblesse is a Swedish confectionery product consisting of thin milk chocolate plates with corn flake crumbles that add a "crispy" sensation. Introduced by Sweden's leading chocolate company Marabou about a half-century ago, it is today owned by Kraft Foods. Last spring, Noblesse received a makeover from the Swedish design agency Silver, who had previously designed most of the packaging for Marabou's products. After some time with a more casual design featuring a hand-drawn coffee cup and friendly script wordmark, this redesign brings back some elegance and premium signals. The new design has been around at least since May this year. Some before/after pictures below. One of the largest pulp and paper manufacturers in North America, the Montreal-based AbitibiBowater, announced yesterday, October 11, that it was shedding its long-winded name to become Resolute Forest Products (or Produits forestiers Résolu in French). The new name will launch on November 7. According to a press release, the name was selected through an internal process, which involved submissions from employees. The company was formed in 2007 through the merger of Abitibi Consolidated and Bowater, and the previous logo was adopted some time after that. SQLI, a French information technology consultancy, adopted a new corporate identity back September 22. It was created by the company's own SQLI Agency. It intends to reflect the company's core values, "innovation, expertise and quality". A press release says it is inspired by constructivism, dadaism and Bauhaus, and the company hopes to be as transformative as these art forms. A minimalistic colour scheme consists of red, black and gray. The symbol represents the combination of expertise as well as "the idea of a trajectory, a target objective". In September, it was reported that Air Seychelles, the national airline of the Seychelles, is introducing a new logo and livery. Air Seychelles' fairy tern symbol dates back to the 1980s, and this refresh is the most profound change to the symbol since its introduction. The airline last updated its logo around 2007, when the logo-type was altered. The new identity is inspired by the nature of the Seychelles and the shape should remind one of hills and leaves. Instead of two distinct green and red shades, the logo now features many bright tones to provide depth. The fairy terns have have been softened, providing a "streamlined" effect. The word "air" is a lighter shade of blue, while "seychelles" is darker, symbolizing sky and ocean, respectively. A press image of the new livery can be found on Airliners.net. A press release talking about a "soft launch" was sent out around September 19. The new logo is yet to launch on the company website, which has had the press release about the rebrand removed. It is republished here for posterity. Back in July, the Paris-Sud University decided to adopt a new visual identity, with an official launch scheduled for November 1. The new identity intends to be dynamic and modern while expressing the university's "human, historical and scientific" values. Paris-Sud University has about 30,000 students and is spread around campuses in the southern suburbs of Paris. It is a renowned science unviersity with several world class scientific laboratories. The launch the new identity seems to continue the dismantling of the odd French habit of including numbers in unversity names. The new logo features an interesting P-S lettermark. The shapes and curves from that mark are also used on templates for printed materials. Earlier this year, the Belgian cable company Telenet won the rights show a lot of football. As a consequence of this major content boost, it decides to relaunch and rebrand its sports channels in a very short timeframe for a relaunch in late July. Having previously operated under the name "Prime Sport", the sports channels would now be gathered under the banner "Sporting Telenet". The French broadcast design agency Gédéon created the on-air design, while the logo is credited to "a Flemish communications agency". A montage of the new on-screen graphics is available on Gédéon's website. Some selected screengrabs can be found below. Vix Technology is a company that creates and operates "Automated Fare Collection" systems and associated technology solutions for the transit sector. Based in Melbourne, Australia, it has offices around the world. A week ago, on October 3, the company unveiled a new corporate identity that gathered several business units under one common name, Vix. At the same time, Vix adopted a colourful 'pinwheel' symbol.